There are five cranberry marshes totaling 169 acres located within the direct drainage areas of Musky Bay, Stuckey Bay, and the West and East Basins. Additional cranberry bogs totaling 111 acres are located in the direct drainage to Sissabagama Lake, the eastern-most lake in the Upper Couderay River watershed. On the bottom left of bottom photo are the two Zawistowski cranberry bogs, the east bog on the eastern-most part of Musky Bay, and the west bog that draws from and discharges into the mouth of Musky Bay. Cranberry bog discharges are high in phosphorus and harm the water quality of LCO. 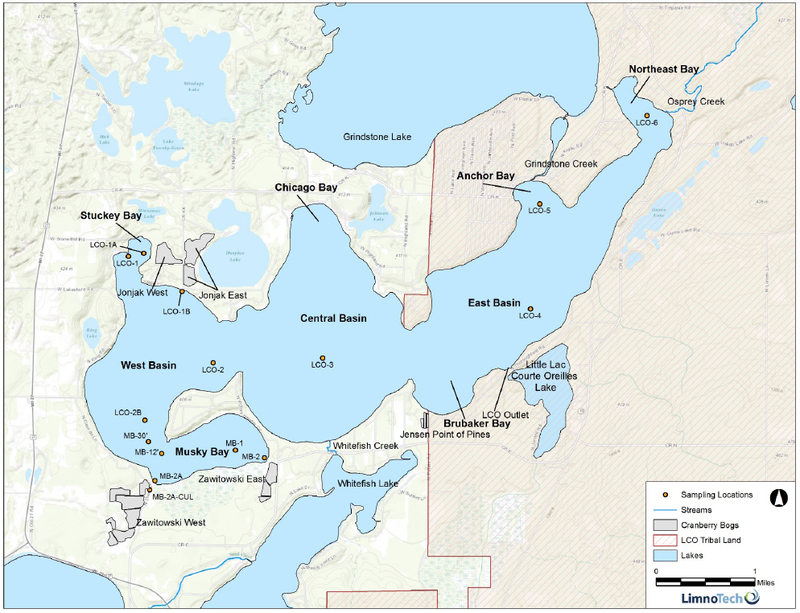 The polluted and degraded condition of Musky Bay was the subject of a 2004 lawsuit brought by 14 property owners and the State of Wisconsin against William Zawistowski. The annual phosphorus load for LCO is a little over 5,000 lbs. COLA and the LCO tribe have determined that the phosphorus load should be reduced by 1,427 lbs, and cranberry bogs represent 592 (41%) of those lbs (TMDL, table 10 ). This will be a difficult task without the cooperation of the growers since cranberry production is mostly unregulated at local, regional, state, and federal levels.